‘A rose by any other name would smell just as sweet’. Truer words have never been spoken especially when it comes to this blush. 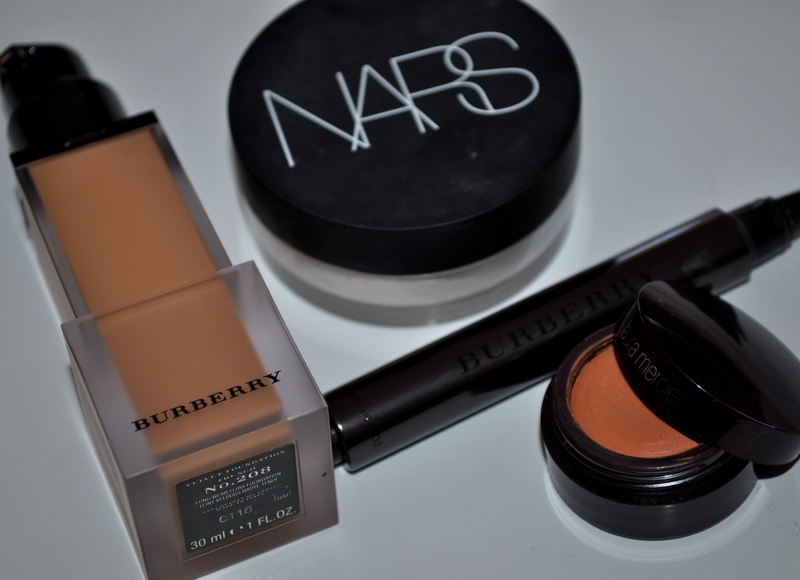 From the moment I first purchased this blush a few months ago right up until I started this post, I thought that I purchased my Burberry blush in the shade ‘Blossom’. 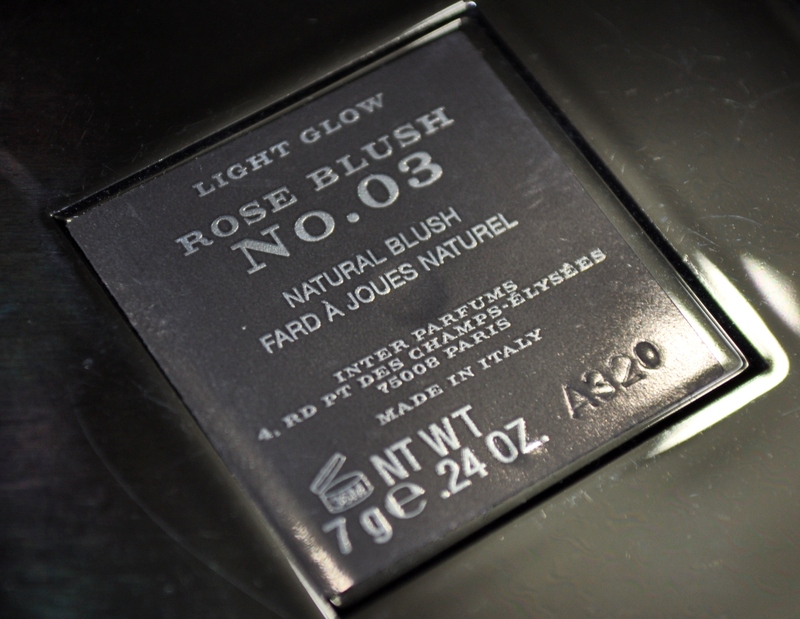 As I was taking photos today, I noticed that I’d actually purchased the shade ‘Rose’. I’ve been recommending Burberry “Blossom” ever since I got it but that won’t change now that I know the correct name. After doing some research and comparing both, I’m actually glad I ended up with the shade I did because Blossom (while beautiful) seems lighter than Rose so it might not have showed up as well on my skin tone. 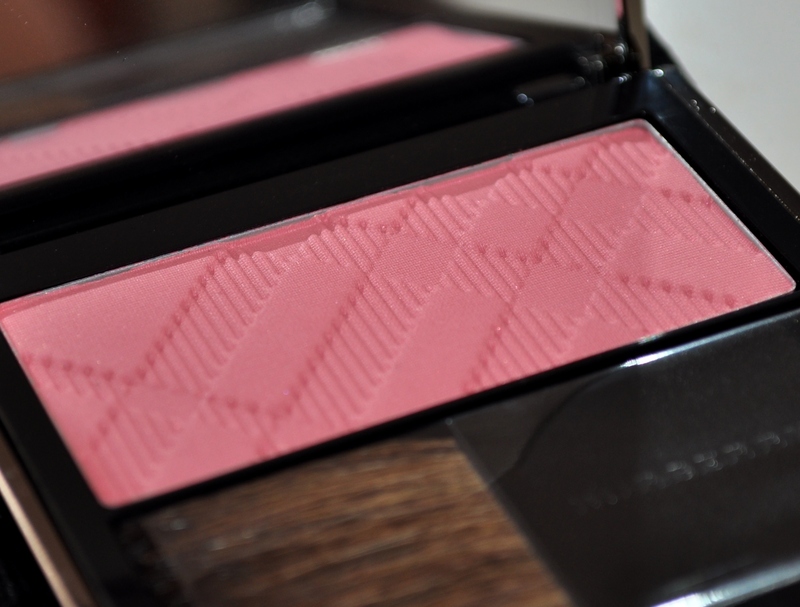 Considering how much I’ve raved about Burberry products on my blog such as here and here, it’ll come as no surprise that I’m a fan of this blush. The packaging is chic, the colour is gorgeous, the texture is soft and the brush is actually useable (in a pinch). 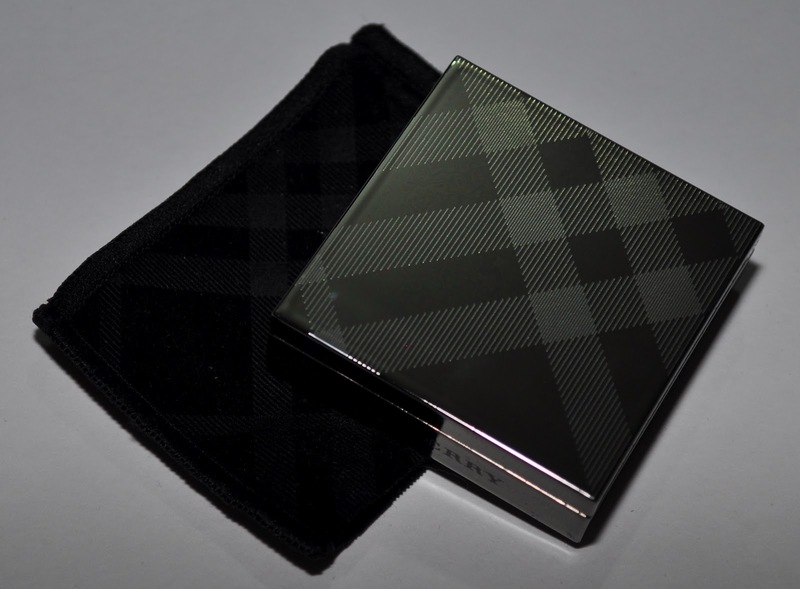 As with all Burberry powder products, the packaging and the blush comes embossed with the Burberry check on it. 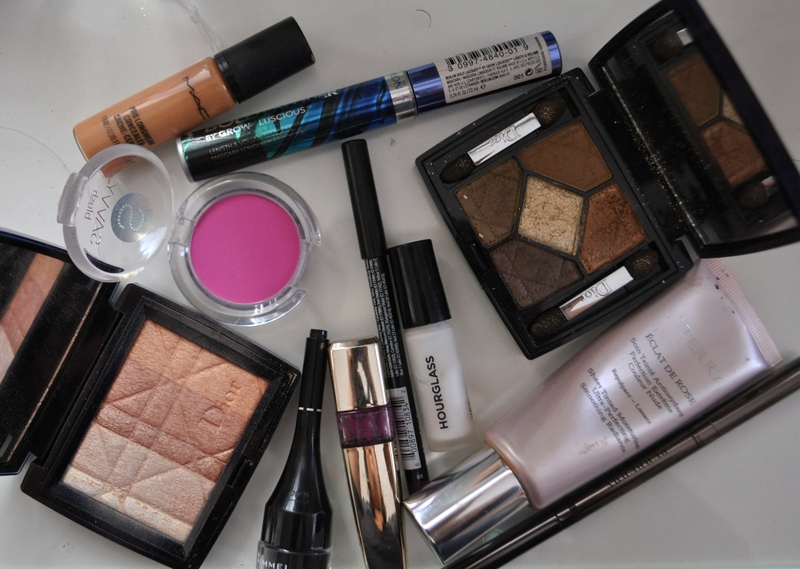 Even though I’ve used it a lot, the pattern is still noticeable on my blush. While the product looks matte in the pan, there’s a very slight shimmer running through it. I don’t really like blushes which have a lot of shimmer or glitter in them because they tend to emphasise the pores on my cheeks. 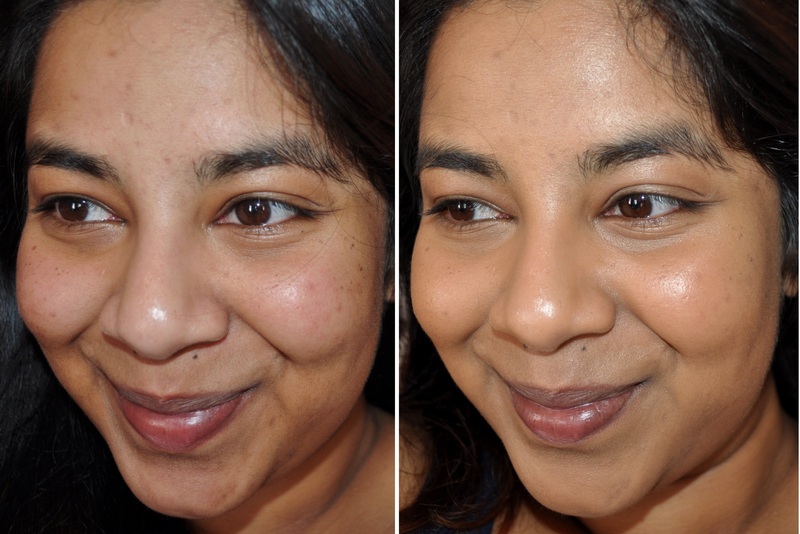 The shimmer in this blush though looks lovely on the skin and just adds a slight radiance to the cheeks. The shade itself is a gorgeous rose colour which has a slight coral tinge to it. I have a lot of blushes but I don’t have anything that similar to this in my collection. 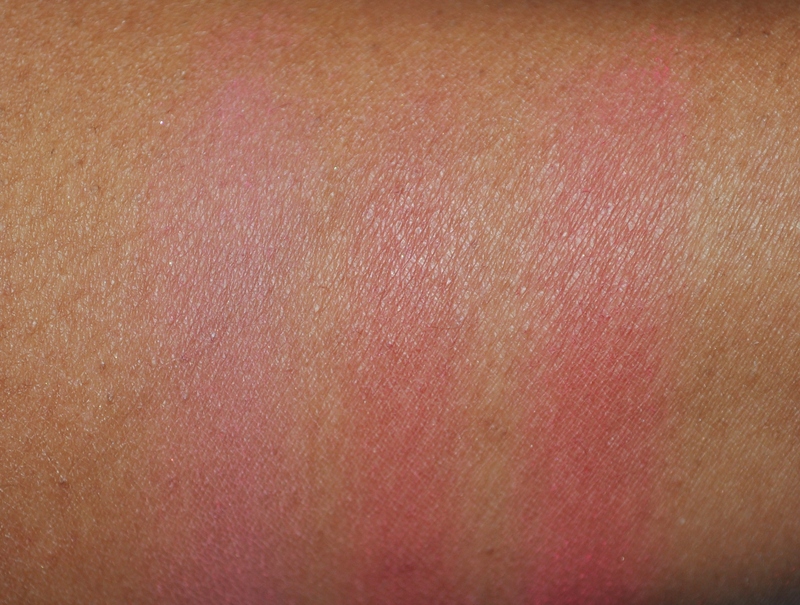 I did a quick search through what I owned and swatched it against the two closest blushes I could find. 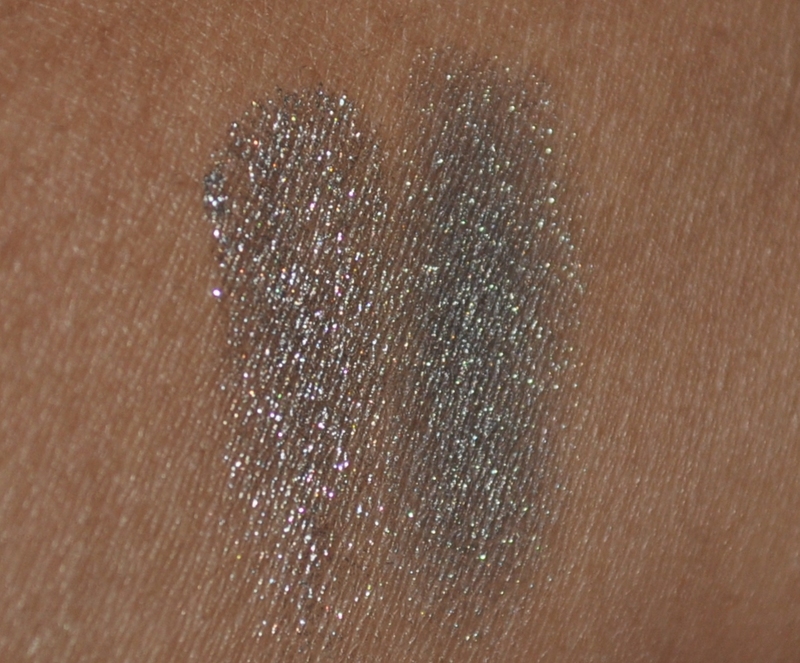 Looking at the swatches though, they’re actually not that similar. 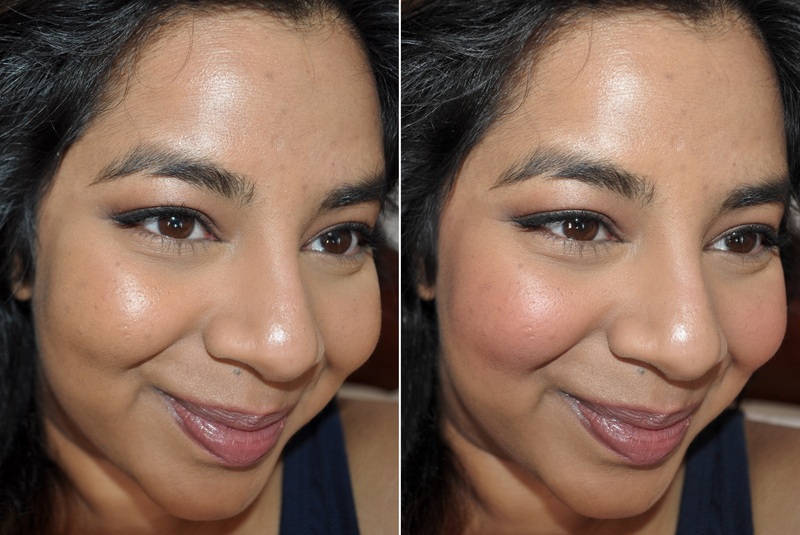 I find that the shade shows up quite well on my skin tone and think it gives a really nice rosy flush to my cheeks. 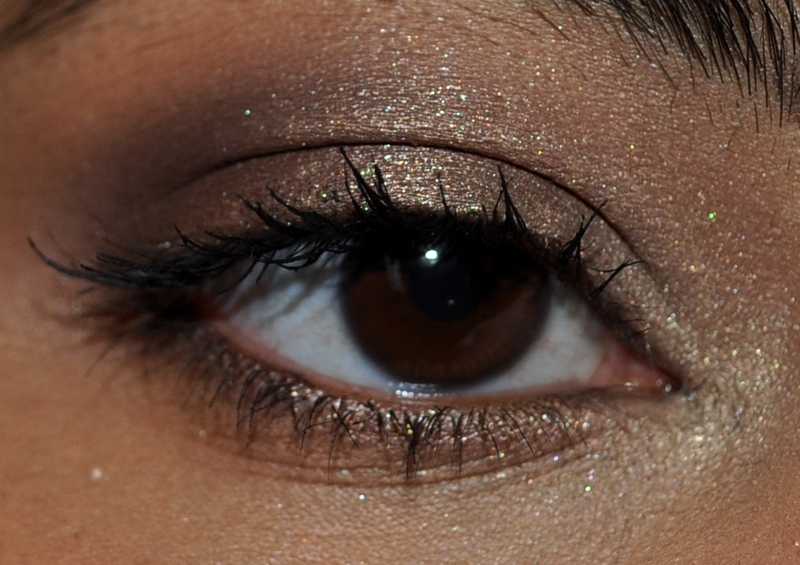 It also pairs well with both natural and darker eye looks. 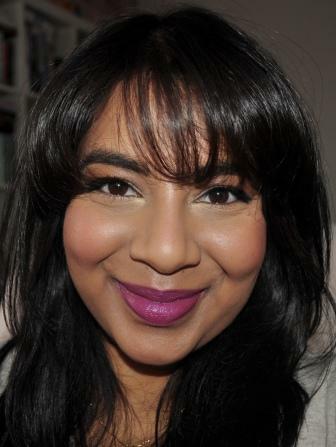 Also, as it isn’t overly pigmented , I don’t have to be too careful when applying it like I do with my NARS and Illamasqua blushes. If you have a lighter skin tone though I would apply it with a light hand. On the downside, I don’t think it wears as long some of my more pigmented blushes but I can usually get at least 5-6 hours wear without too much fading. Unsurprisingly, one of the biggest drawbacks of this product is the price which, at $42 US/ $75 AU, isn’t cheap. It is a nice blush to own and there’s a good range of colours available so, if you’re looking for a new blush, I’d check these out. 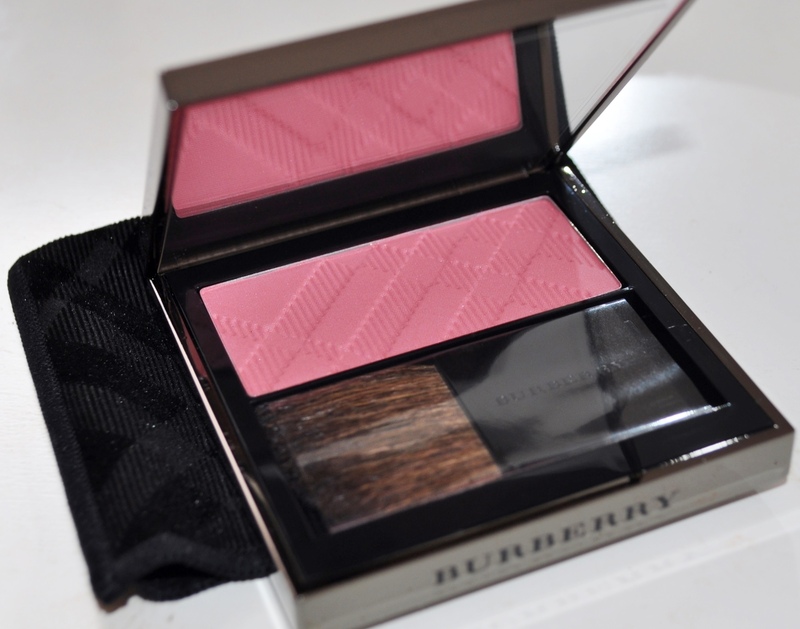 Have you tried any Burberry blushes? I started the year with a resolution that I was going to stop buying so much makeup and start shopping my stash. Unfortunately that resolution lasted about a week until I got properly introduced to Burberry makeup and there’s just no going back. I haven’t been this into a brand in… well ever! I really love how the whole range focuses on naturally enhanced beauty with very chic colour choices. It also doesn’t hurt that the Burberry girl at the Melbourne city store was so lovely and helpful (thanks Ashley!). 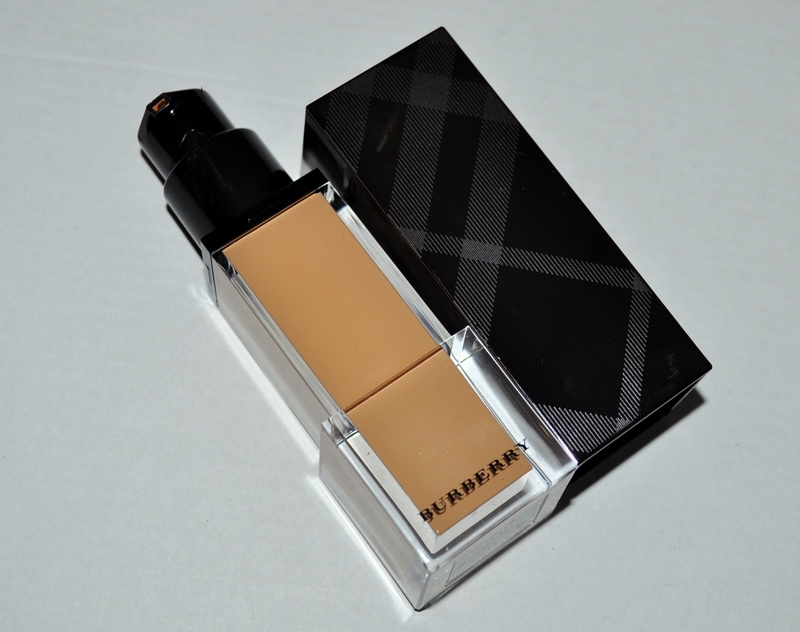 So far I haven’t tried any part of the Burberry range that I haven’t loved but my absolute favourite item so far has to be the Sheer Luminous Fluid Foundation. First of all, just take a look at that bottle! 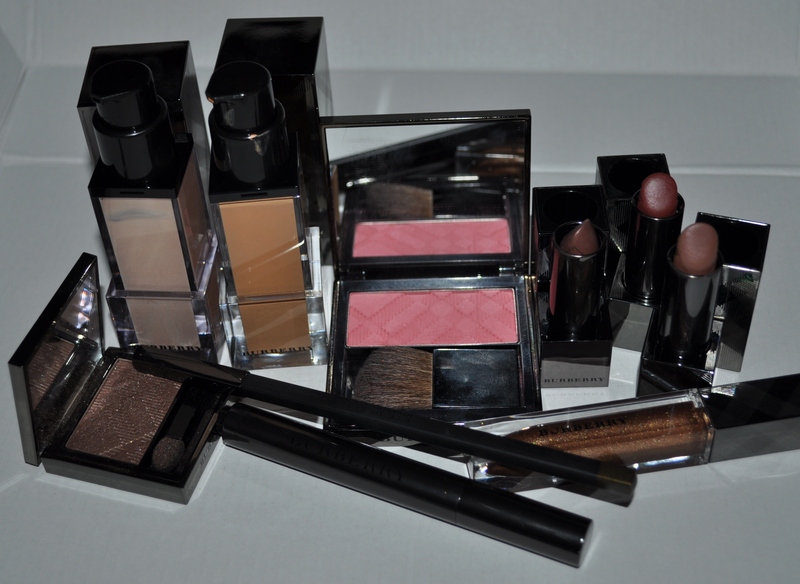 Everything in the Burberry range exudes elegance and is just made to be displayed on your dressing table. The bottle comes with a pump that releases the perfect amount of product. My only issue with the packaging is how much of a fingerprint magnet it is! 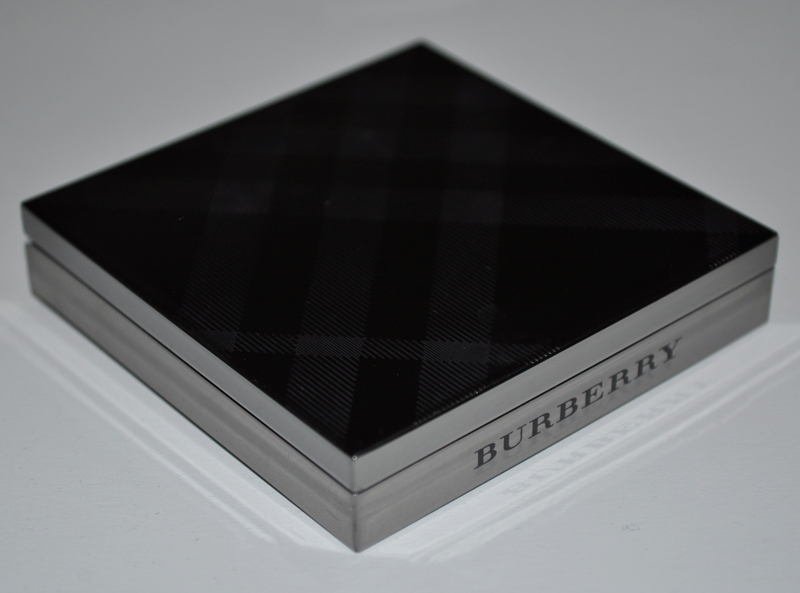 The beautiful metal with the Burberry check starts to look dirty after just one use but it’s nothing that a little wipe down doesn’t fix. There are 13 shades available and , while I can’t speak to the lighter shades, I think Burberry did a pretty commendable job with their shades choices in the darker shades. The shades on the darker end of the spectrum have a good amount of yellow in them and I think there are an impressive amount of shades available (although the jump from shade 12 to 13 seems to be quite big). 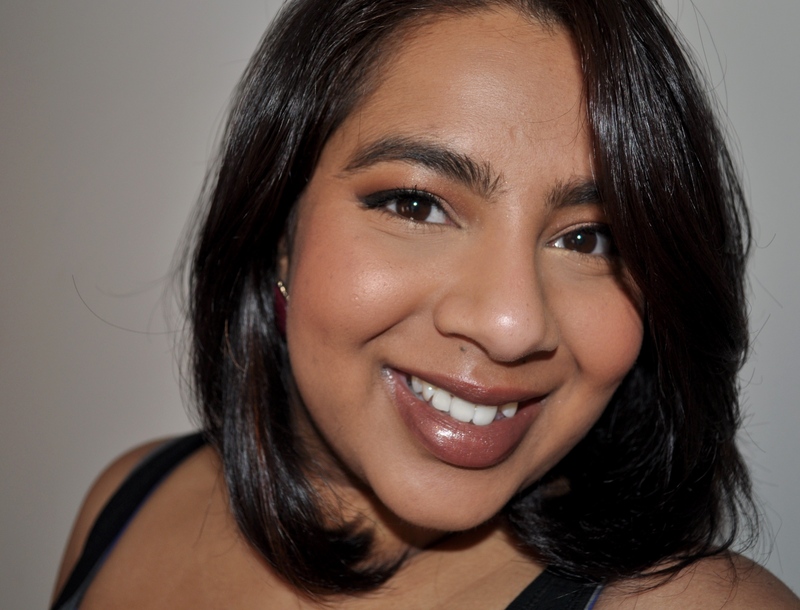 Check out Karlasugar’s post for swatches of all shades. Here’s a comparison with some other foundations in my collection. Click to see it bigger. 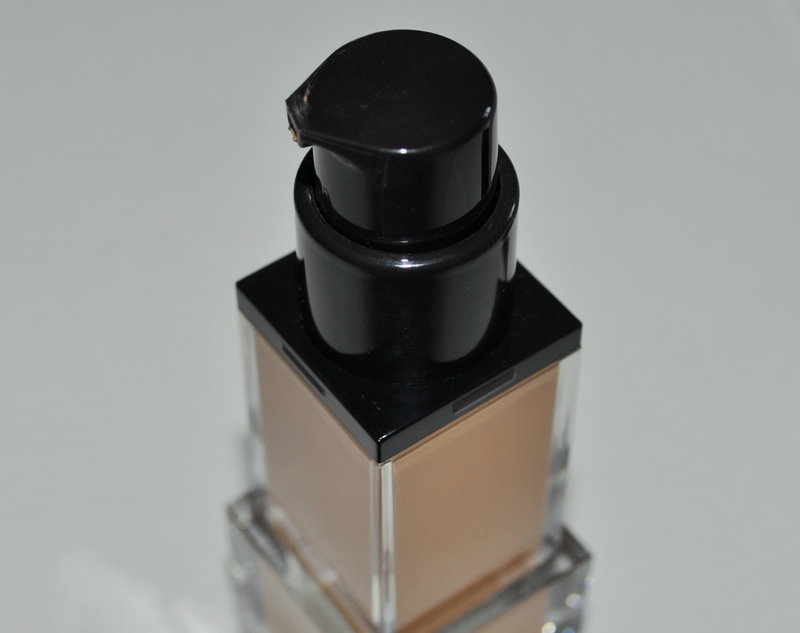 I picked this up in the shade Trench 10 and I have to say that this is a pretty perfect colour match for my skin tone. This doesn’t pull ashy on me and, if anything, is slightly more warm toned than my complexion. The texture is really beautiful and a little goes a long way. 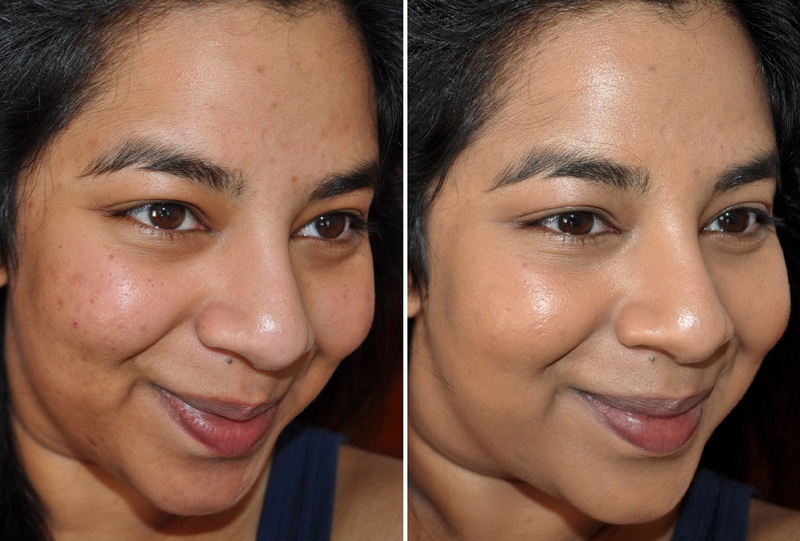 The coverage is medium build-able and the finish is a natural skin finish that leans slightly dewy. I have normal/combination skin and I get oily across my cheeks and t-zone by the afternoon when I wear this all day but if I touch up half way through the day with a little powder, this lasts really well. What I love about this foundation (apart from pretty much everything) is how weightless this feels on the skin. I honestly don’t feel like I’m wearing foundation and I feel like it gives a very natural but quite perfected look to the skin. I also love how this photographs and haven’t found any issues with flash back. 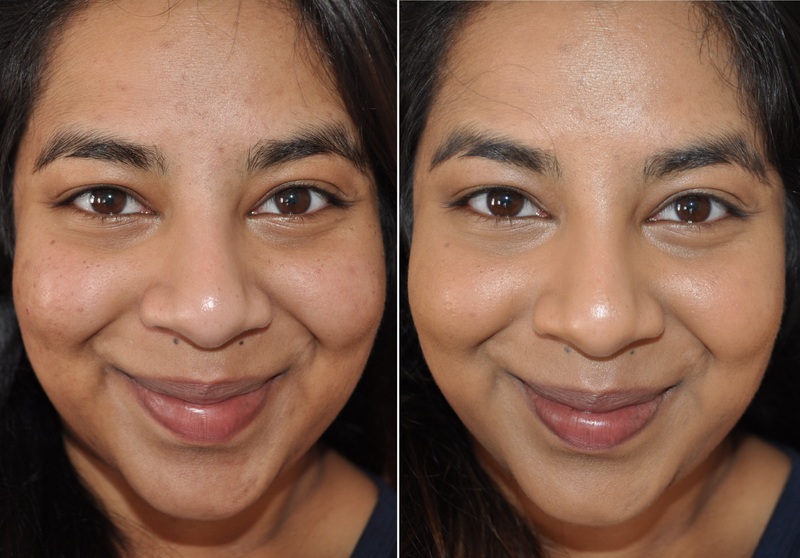 I’ve worn this without any setting powder and found that, while it did wear away throughout the day, the texture and shade match meant that my skin didn’t look patchy. 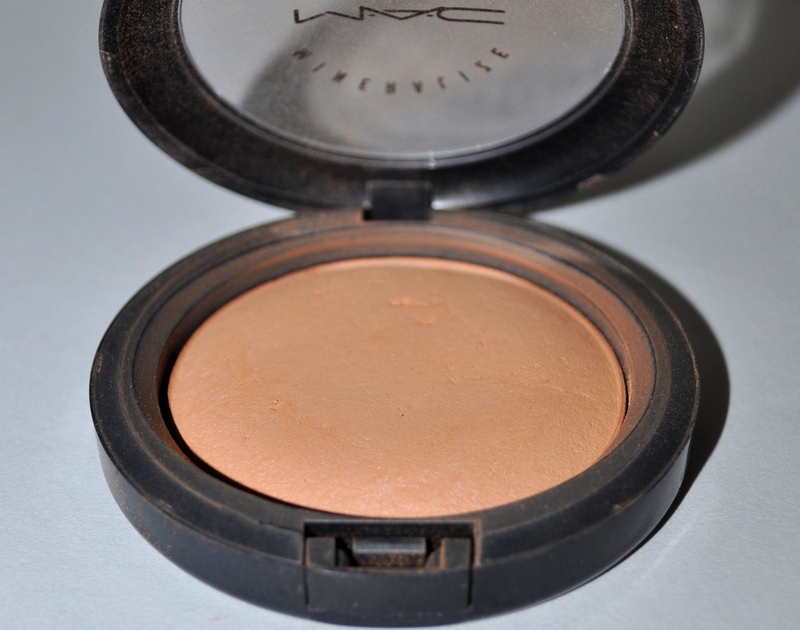 I prefer to set it with a dusting of MAC Mineralize Skin Finish Natural (although the Burberry Powder foundation may or may not be making it’s way to me right now… I know I have a problem!) or some translucent powder. This final photo is how the foundation looks when I’ve done my whole face. This has definitely become my go to foundation during the day. The only thing not to love so much is the price. This product sells for a little over $70AUD for 30ml but I think it’s worth it for the quality of the product. If you’re looking for a new foundation and don’t mind splurging, I highly recommend this one. I’d been eyeing the Burberry range since it launched about 2 years ago and have been wanting to try out some of the range. 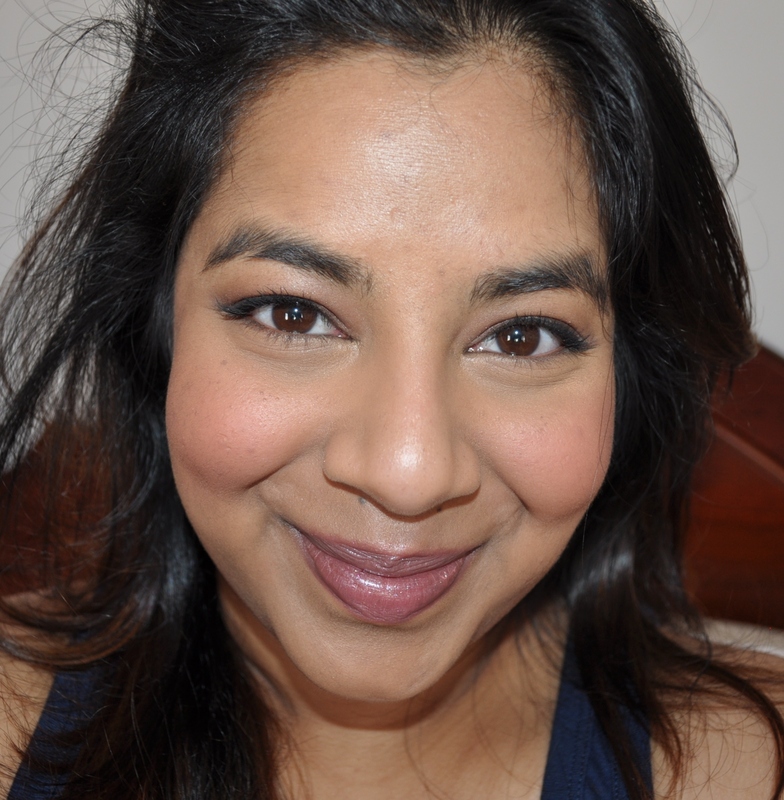 I finally got a chance to purchase some items when I was on holiday 2 months ago and as I’ve always loved the quintessential Burberry-esque smokey brown eye, I picked up Midnight Brown eyeshadow first. 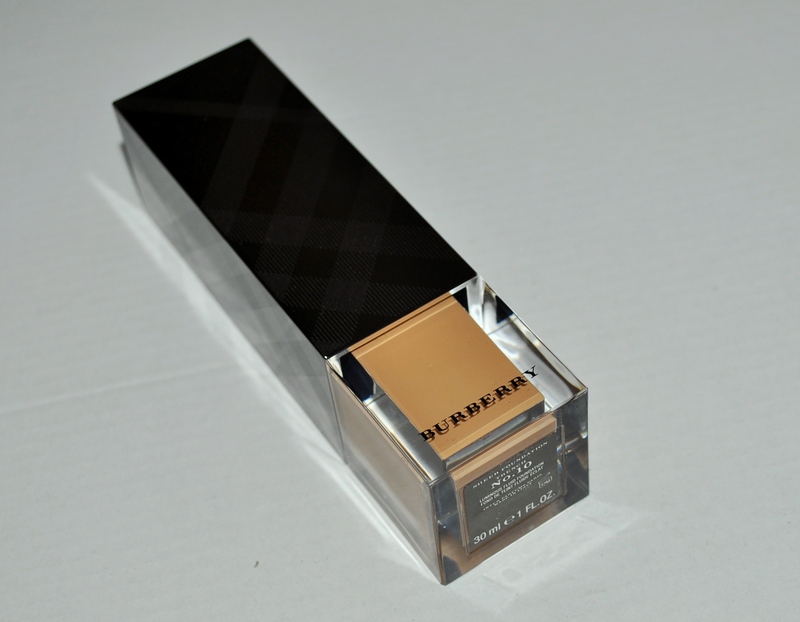 The Burberry name automatically conjures up an image of effortless and chic style and this translates well throughout the products in the makeup range. 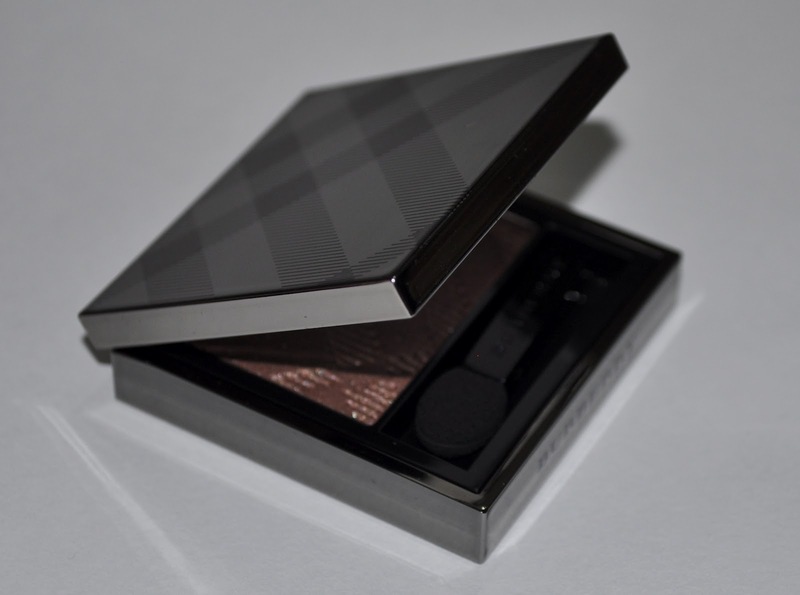 The eyeshadow for example, comes complete with its own little velvet pouch with the Burberry pattern embossed on it. 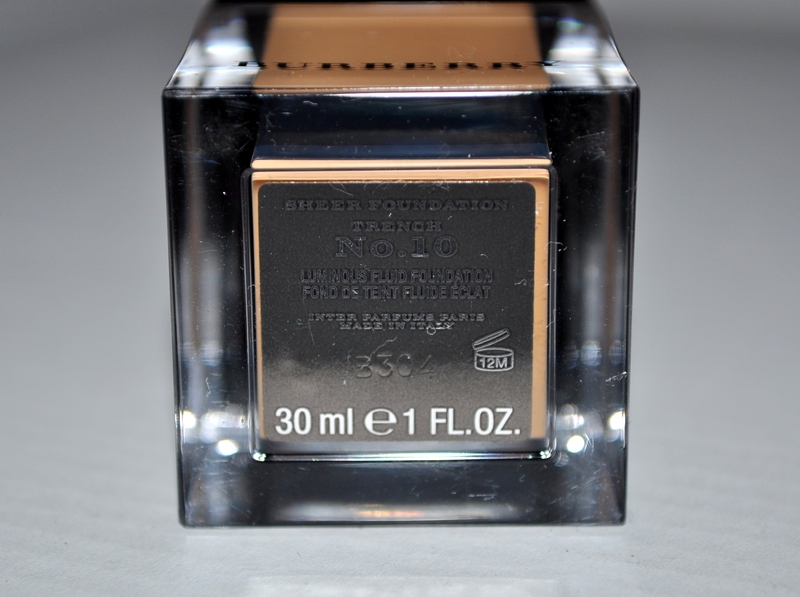 The metal container the shadow comes in feels lovely to hold and also has the Burberry pattern embossed on it. The product comes with its own applicator and a mirror but, while nice to have, I find both these items useless in eyeshadow singles. 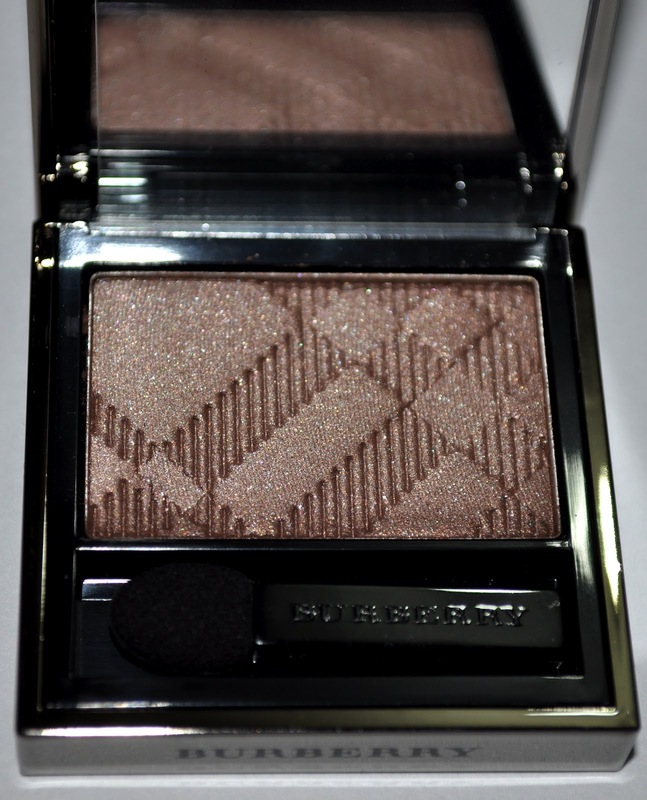 I love how the Burberry pattern is even embossed on the eyeshadow itself. It’s so pretty! It took a while for me to disturb the pattern but even after quite a few uses it’s still very prominent. Midnight Brown is such a gorgeous brown shade. 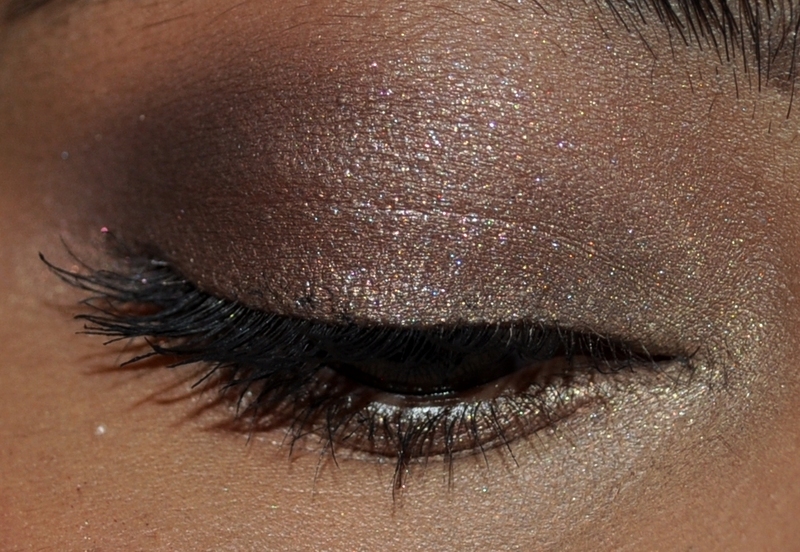 It’s like a rich chocolate brown taupe with shimmer through out it. I thought I had similar browns in my collection but it’s actually a noticeably different shade. From left to right Burberry Midnight Brown, MAC Mulch, the darkest brown from the Dior Iridescent Leather quint, Illamasqua Ore pigment, the dark shimmery brown from the Sleek Storm palette, Smog from the Urban Decay Naked Palette and Snakebite from the Urban Decay Naked 2 palette. 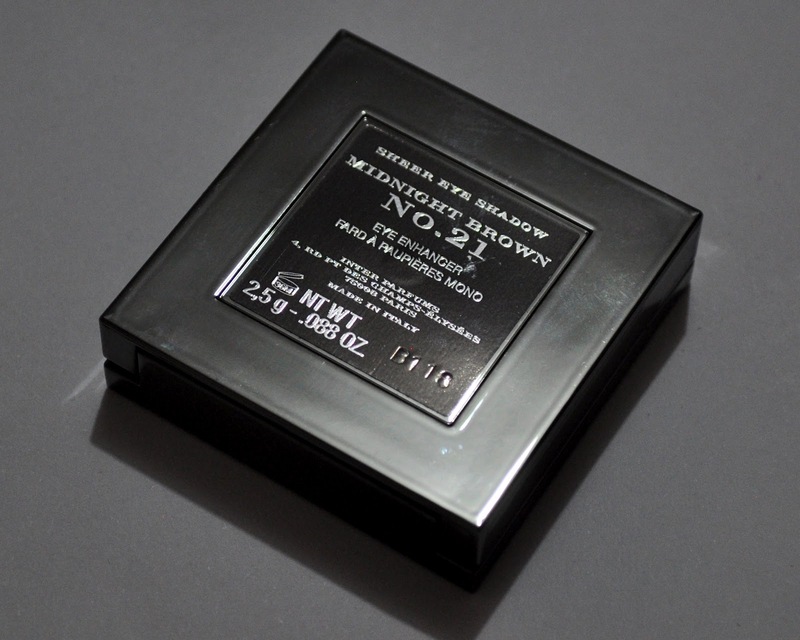 I love this eyeshadow as the quality is very good. The shade is pigmented and the powder is soft and easy to blend. I always use this on top of a primer but I haven’t noticed any fading or creasing. 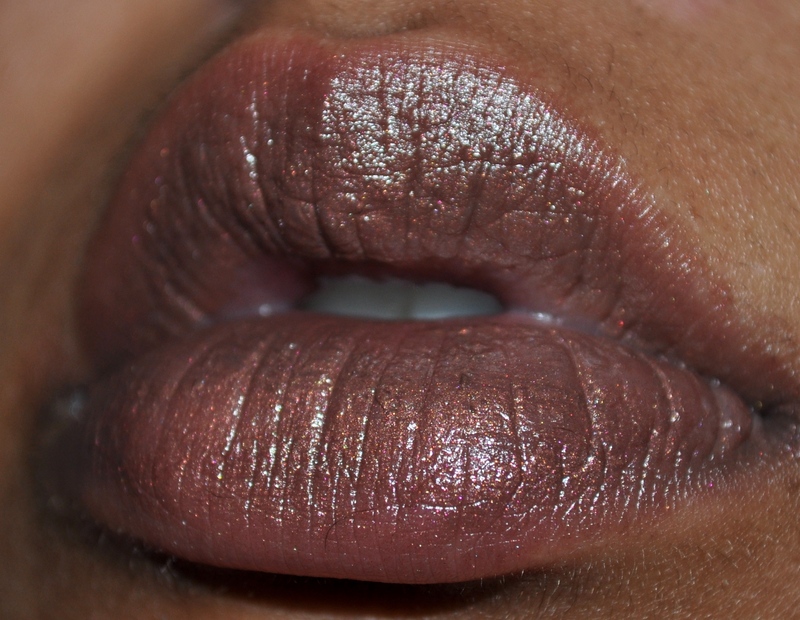 This shade works well both on the lid and in the crease and I use it in a variety of ways. 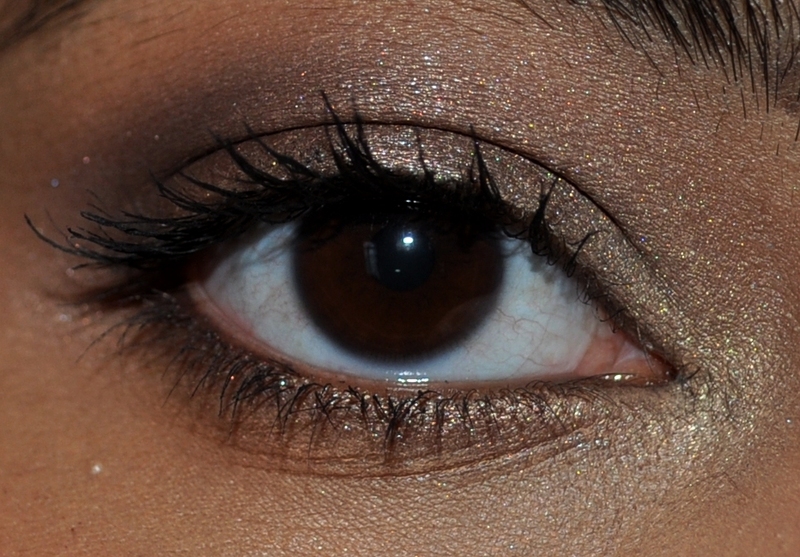 One of my favourite ways of late is to use it to create a one shade smokey brown eye such as the one below. 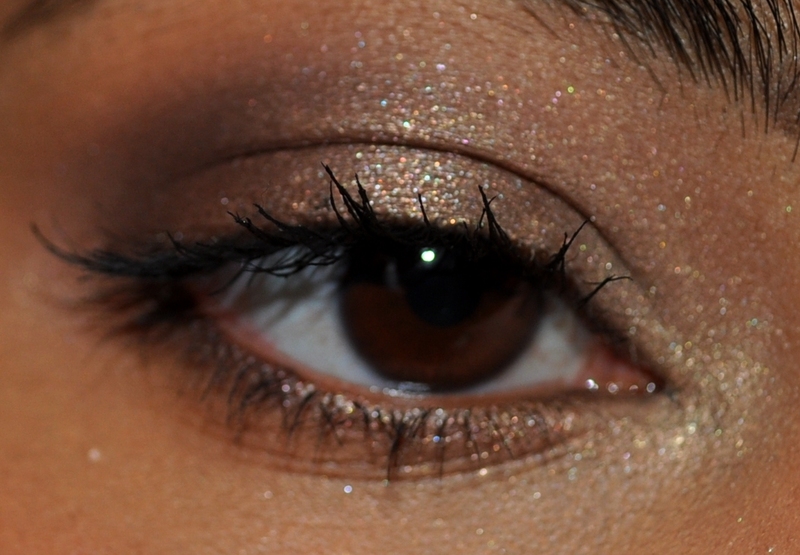 To get the look I first applied MAC Cash Flow Paint Pot (gold) all over the lid. I then picked up some Midnight Brown eyeshadow on a MAC 217 blending brush and concentrated the colour on the outer V and then blended it into the crease. Once the brush had less product on it, I then blended it across the lid. I finished up by applying a light gold around the inner corner (Bobbi Brown Sunset Gold eyeshadow) and used Urban Decay Corrupt 24/7 glide on liner on the bottom lashline. I went over this with some of the Midnight Brown as well. This next shot really captures the lovely shimmer in Midnight Brown. What do you think of Midnight Brown? 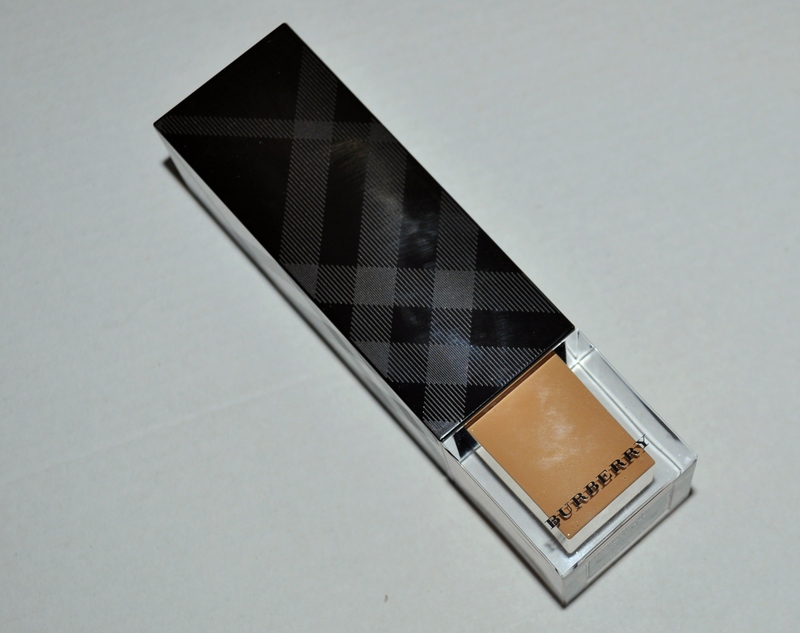 Have you tried anything else from the Burberry range?